I remember being quite intimidated by that painting and nearly tripping several times in an effort to keep my eyes on it while going up or down the stairs as a child. It was one of the first pictures I saw where the eyes had that uncanny ability to follow you wherever you were. I remember that basement well, Cole. My memory is of standing in line with my Sears Wishbook, looking at all the toys, waiting for our turn at the window to get our packages. Jeremy, I bought the K-Tel “Rock 80” 8-track at Woolworth’s! And I learned how to decorate my walls by taping album covers on them from Record and Jeanswear! What was your favorite record shop in town? Woolworth’s? Record and Jeanswear? What about Pro Audio or Record Review? Remember all the clothing stores that used to be on Main Street? Que Pasa, Jolly Jean Giant, Racusin’s, Arcus Dress Shop, Eudora’s Corset Shop…and what about The Small Mall? And how many shoe stores did we have? J.S. Raub’s, Endicott Johnson’s…what else was there? I think I do but he never helped me. I was always helped by a nice, white-haired lady, but I only remember her name as Winnie because that’s what she always called me. I had a yellow shirt with a small embroidered logo of Winnie the Pooh holding a balloon…I probably only wore it once to buy my new school-year sneakers but I was “Winnie” for ever after that to her. Does anyone remember her real name? I got the fastest pair of sneakers in the world from her one year. They were so awesome that, after walking uptown to watch the new Superman movie at the Capitol with my grandmother, I ran leaping home, convinced that I too, could fly. To look at all the images, use the forward arrow above the image. Our guest contributor today is local photographer, Bob Rush, who provides us with a great photo essay. He set out to capture some of the beautiful fall scenery around town. Please enjoy his stunning work. In the comments, let’s think about our favorite Bloomsburg fall memories or activities. Personally, the pictures have me thinking about a fantastic family photo that we took in the Town Park at the peak of the fall color a few years ago. My two children and my nieces and nephews were throwing leaves and jumping in huge piles of crunchy leaves. I’m sad that no one will get that opportunity this year. 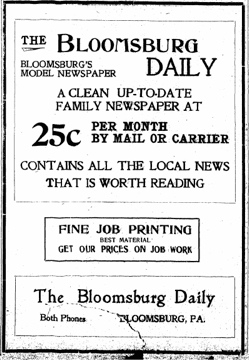 When The Bloomsburg Daily launched, we knew we wanted to focus on the needs of the community. Our first inclination was to provide a new voice that would address the news of our town in a positive manner. What we discovered was that we could not only provide good stories on a regular basis, but also solutions to common problems in town. Most larger communities have a Craig’s List site that provides residents with an easy and free way to buy, sell, and barter items. After contacting craigslist.com we found that it takes nearly twice as many people locally to get Craig to bring his list to a town. So last weekend we launched our free Bloomsburg Daily Classifieds and at a week old, we already have some listings. The thing that is going to make this a success is you! The more you help us get the word out, the more listings we can share. Listings are free and remain open for 45 days. Anyone can easily create an account and a listing. In addition, last weekend we met with a group of readers from the Bloomsburg area. One of the top things on all of their minds was an events system that could help the area know what was going on. Walking away from that meeting, we felt it was critical to provide a free and open events directory. 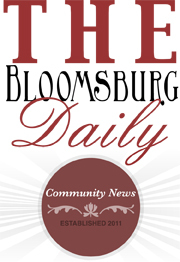 With that in mind, last Sunday we launched the Bloomsburg Daily Events Calendar. For now you have to email your events to us, but in the very near future you will be able to log in and add your own events giving Bloomsburg a centralized place to share information about what is happening in our town. That means the Town of Bloomsburg now has free classifieds and an events calendar that can be linked to, shared, and updated with ease. What are you waiting for? Add your listing to the classifieds or the event calendar now! This is your column. It is our hope you will use it to tell our stories: Bloomsburg’s stories. It will grow and meander, just like a conversation. It is a conversation: our conversation with our past. Where is this going? We’re not sure yet. It’s up to all of us. My name is Jen Ralston and I was born at Bloom Hospital in 1971. I moved to New York City in 1989 to attend college and stayed there to pursue a career in sound editing for film. I still work in that field and because of that, I usually have to be somewhere other than Bloomsburg for work. But I come home whenever I can and I still call Bloomsburg my home. I remember watching a soft-spoken man named Charlie hand-toss fresh pizza dough at — where else? Charlie’s Pizza. We were a Charlie’s family, for sure, but I loved Luigi’s thicker crust. And, of course, their arcade room and all the different pinball machines! Remember the one that was named after a card game? The goal was to use the flippers to knock down tiles that looked like cards. Was it poker? Blackjack? Which was your favorite pizzeria on Main Street? Do you remember the Texas Lunch? Chili cheeseburger with mustard and onions – that was my favorite at Texas. They had great fries, too. The only fries I’ve had since (outside of the Bloomsburg Fair, of course) that compare are from In-n-Out Burger. I also remember their jukeboxes – one in each wooden booth. Most of the selections just had the artist’s name and two songs (the A and B sides of a 45…remember those? ), but for some reason, Linda Rondstadt had a single on the juke with a tab that was a tiny picture of the cover for the Living in the USA album – a photo of her in roller skates. Do you remember Woolworth’s soda fountain? I used to love their vanilla Cokes and floats. What about their candy selection? Candy cigarettes and bubble gum chewing tobacco? Pop rocks, wax soda bottles, and pixie sticks? As I was heading to work last evening down Main Street, I couldn’t help but notice the big yellow CAT back hoe along with several dump trucks on the west end of town. It sat on a piece of property that had been a house just over 30 days ago. They were on site to start demolishing the first of what will be many homes lost to the water. It seemed strange to see what was once someone’s home turned into a pile of rubble being hauled off to the landfill. I spoke with the foreman about the homeowner rebuilding. He replied, “They’re done, not coming back.” Hopefully this isn’t the same for everyone displaced by this event. This morning after getting my daughter on the bus to school, I decided to take a ride around Bloomsburg and Fernville, bringing along my camera as well. It has been a month of rain, rain and more rain — but the town is slowly getting cleaned up due to this. I traveled thru the park’s baseball fields, along 11th and 12th streets, the High School, and then out Railroad Street to the fairgrounds crossing over to Fernville. Some debris is still there — a wrecked shed that floated from one place, tires and mud in another, the picnic table out of place, and fences that are half missing. One thing I noticed was that so few homes were being worked on. I counted under 20. Those I did see were having drywall replaced, interior walls rebuilt and painted, siding being torn off with new ready to go on. Maybe its due to everyone back working their full time jobs now, only to come home (if they can come home) to another full time job along with taking care of the normal things. Well, what’s normal now? I can’t explain it. Houses are going to be missed and family heirlooms are impossible to replace. Rebuilding will be very hard, very tiring, and take some time, but Bloomsburg will rebuild. Thanks to everyone who came out afterwards to cleanup: Bloomsburg University Football, Field Hockey, and Soccer teams, the Bloomsburg High School Football team, the surrounding Fire Companies, Red Cross, AGAPE, and anyone and everyone I missed for giving their strength, and the people around the country who supported or donated whatever they could. Now, the town needs you again — to finish what was started. Because Bloomsburg will rebuild. The original call to arms. Now being used to re-engage our community.